You mentioned something about how we want to use intellectual tools to rate others. Can you tell me what’s behind that? There’s usually one thing behind why we’d want to do that and it’s got a lot to do with ourselves feeling inferior to begin with and we turn that around in ourselves and manufacture a belief that we are superior, that we are better than others based on something we see ourselves as having or something we feel we’ve accomplished or achieved. What we then do is use this as a type of gauge, or measuring device which we literally carry around with us in our minds to compare others with. There’s a number of problems with that, but primarily and regardless of how accurate our gauges are, which by the way are often extremely inaccurate, there are issues of love that we should be addressing if our intention is to truly grow. One way we can look at this logically is by examining what God‘s perspective might be and how God views us. Once we do that, we can then see how our views differ from God’s. How would we know God’s view on us? We can have a good idea by using our logic from what we know right now, even if we cant feel how God feels about us right at this moment. But firstly before logically analysing this, I can tell you that God doesn’t rate us against each other based on how good we are or how loving we are or anything like that and to be honest it wouldn’t make too much sense if he did that but we’re going to determine why that is in just a bit. To do this, we can first take the stance that God is a perfect designer, although the problem here is a lot of people don’t see God that way and that’s understandable because many of us feel like God made a mistake with us as a human race. Sometimes too, we feel individually that we’re broken and that nobody else is broken like us and on top of this, many of us feel we’re actually imperfect at the core, so that’s why we feel that no matter what we do, or how hard we try, we’re just going to mess things up and make a mistake, so then we often conclude things like there’s no point to even bother trying because we’re programmed to fail anyway. Although what we’re really doing here is intellectually justifying the fact that we’re actually wanting to avoid taking personal responsibility and there’s a reason for that too but we can talk about this in more detail later on. The point is though, many of us will automatically have a lot of issues with the idea that God designed us perfectly, so we can start looking at how that’s plausible from what we know right now and the truth is, we can actually do this quite easily. lets start to analyse this concept that God has made mistakes with us, individually or collectively, we can do both at the same time. What we can do is to take just one aspect of God’s creation that we know something about and use this as a starting point. For this exercise we also need to take the stance that there is an intelligent creator of everything we know, so we’re saying God exists. There’s a lot of ways as well to determine logically that God exists, but for now and for this exercise, we’ll start with the idea that God exists. For this exercise we’ll need to isolate one aspect of God’s creation and we’d also need something that we right now can clearly see the effects of. We can clearly see the effects of the laws governing the physical universe, such as the laws of motion which talks about how objects move through space for example. We see the effects of that law every day, so it’s a good starting point. The thing with studying any single law in the universe is there reaches a point where we cant look at it in isolation anymore without considering other laws. Say for example, we’re studying the motion of a certain comet and we want to know where it’s going as it passes through our solar system. If we’re solely investigating it through the laws of motion, we’d be looking at the comet’s speed and know something of it general direction but it won’t be enough to tell us a lot about its exact path. For that we’d need to take into account the laws of gravity because we have gravitational forces of all the nearby planets and our sun, and if its on a long orbit we’d also have other suns and planets exerting a significant pull on this comet as well, and that’s going to affect the path this comet’s on. But if we want to get really accurate, we need to know a lot more about the orbit this comet is taking, because all comets have an orbit. Some comets can be orbiting through our solar system for thousands of years, so now we’d potentially be investigating objects that move over very long periods of time. Because time itself is also stretched by gravitational forces, to get even closer measurements of where exactly this comet is going, we need to take into account time as a relative factor in our calculations because we can’t be viewing it as a constant measure anymore. For this we’ll be needing Einstein’s theory of relativity to help us better calculate the comet’s long term orbit and predict more exactly where this comet is going. So we started with one law in this exercise, the law of motion and we added a couple more to show how there’s actually multiple laws working at the same time affecting the physical thing we’re investigating, in this case a comet passing through our solar system. We could in addition use literally thousands of other physical laws to calculate even more precisely everything we need to know about this comet and really about anything physically happening in our universe right now. There’s actually a lot of as yet undiscovered physical laws that we could add to get more precise calculations. But whether we’ve discovered these or not, even with the laws we already know about, we can clearly see how they’re all working together in perfect harmony very much like a finely tuned clock, but one that’s actually infinitely more finely tuned and complex than any clock or computer system that humanity’s ever built. From this perspective what we can see emerge are the effects of a very intelligent design, whether or not we believe in God, such things are apparent on their own. From here we can then take the next step and start to question the idea that humankind is flawed. 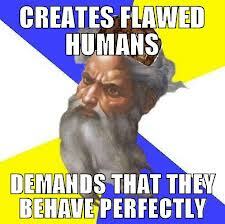 So you’re saying because the universe is designed the way it is, we can’t be flawed? Yes, we might say that it’s possible we are flawed, but as it’s not logical, it’s then highly unlikely. If we compare the perfection of design involved with just a fraction of God’s creation like we have, which, on the scale of things is vastly larger and much more involved than the creation of us and at the same time we have this concept that we are fundamentally flawed, we can see how this poses a contradiction of logic. It’s similar to saying an architect who designs large buildings and bridges is likely to fail in the structural design of a child’s doll’s house. It’s possible but it’s highly unlikely and when you consider that the highly unlikely proposition is the most likely one we go with as a human race, we know logic is no longer involved, so something else has to be. So you’re saying if we take the stance God exists and we look at what’s around us logical we couldn’t say we’re made imperfect? Yes if we take the stance that God exists, and we have an impartial view of everything we see around us, then it can no longer be logical to view ourselves as flawed. Why do you say impartial? We need an impartial view or at least a view with some impartiality to step outside what we already feel about ourselves, otherwise we will view everything we see with that filter and if that filter is saying that we are made imperfect then everything we view outside of ourselves will be seen that way too. However we only need to be impartial while we are emotionally invested in a particular way of seeing things, because when we don’t have that type of investments anymore, we automatically view things impartially, so we don’t need to create a mental framework to view the world any longer. So the majority of us, even if we try to be impartial with what we’re talking about, still feel we’re flawed? The fact is most of us on the planet feel this, even if intellectually, we have the opposite perspective. We can understand why then that the majority of religions that have sprung on the planet are built around this concept of having to purge ourselves of our imperfections. The one’s that pronounce that a single God created everything, still at the same time have this deeply ingrained belief that humankind is born of error, even though this is not logical, as we’ve shown. And is this the same if we don’t believe God exists? Yes, mostly it is, what we then do is we start constructing concepts of the universe that fit our underlying emotional beliefs, no differently than a person who conceives of God existing but the perspective is just one without God, or without a creative intention behind what we know of existence. However the same emotional filter that sees ourselves as flawed is still carried through. So, even though we’ve often convinced ourselves we have a scientific impartiality, our viewpoint hasn’t shifted much from the emotional states that has spawned many of our oldest religious ideas. So why do we hold on to this idea we’re imperfect? Because it allows us to justify our pain rather than to truly feel our pain and this is why many of our belief systems are set up to basically make us believe we deserved our painful experiences. But if, from our hearts, not our minds but our hearts, we truly understood that we are perfect creatures, that God in fact views us as the most perfect of all her creations, we would automatically grieve everything that makes us feel opposite to this. The truth is, irrespective of whatever belief we’ve constructed to tell us otherwise, the pain others inflicted upon us was not deserved nor was it ever justified. And so how is all this related to rating people? Well, by using our logic, we can begin to see that whatever condition we are in right now, we are not sinful, not broken, not debased, not without merit, but rather we’re designed perfectly. In fact from God’s perspective we are the pinnacle of all of her creation. When we truly understand this, we’d have no more room in our hearts for rating others or comparing others to anyone or any other type of rating system or belief we’ve got. When we do that too, we cant be acting from a space of love, love for the other person or for ourselves either. We can’t love the other person, because we’re not even seeing them as they are in a complete way, we only see them as a projection of our own dissatisfaction we have for ourselves. And because this is based on our own dissatisfaction we have about who we are, we’re not displaying love for ourselves either. What we are also basically saying is that we know better than God, because God rates no one, so it’s a position of arrogance we’d have to be taking when we choose to rate others as we’ll. So if I’m rating others, I’m doing it because I feel inferior or unsatisfied with who I am and I don’t want to feel like that, so I become arrogant instead? There’s a difference between making a real observation and having a judgment of another which is what’s happening when we choose to rate others. When we judge we are in fact dismissing a persons true nature, and that is as we’ve discussed, made in perfection. When we judge ourselves, we do this in the same way and so we’re not actually seeing ourselves as we truly are either. God doesn’t judge us, even while we are judging others or ourselves, God sees us completely – our perfection and where we are off the mark with what we’re choosing to do, but he still loves us perfectly and wants us to feel his love at every moment. It just sort of seems illogical that we do all this wrong stuff but we’re still perfect, how can we be both at once? We don’t make mistakes without cause, there is a reason behind everything we’re doing, all the wrong choices we make that basically starts creating further painful effects in our lives have their root in a deeper pain that we carry. We hold on to that deeper pain too not because we are bad, not because we are flawed but because to this point in our lives its all we know, it’s all we feel we can do to manage our painful emotions, it’s all we can conceive of doing to cope. But at the same time we are capable of so much more, but we believe we aren’t capable, we’re imperfect and we’re unworthy. These are just beliefs that have their root in fear, so when we face our fears what we are doing is peeling away the layers we’ve been hiding behind to reveal what’s perfect underneath. And this real self with an abundance of gifts and capabilities, far beyond what we can even conceive, is always here and is only constricted by the fears and our false beliefs made from our fears. These things cover us, and God sees our covers but God also sees that we are much more and far greater than anything that presently covers us. So we need to break through what’s covering us? In truth all our fears we hold are more like a thin plastic film rather than a solid casing, so all we really need to do is begin to truly feel ourselves, feel the body of our soul, feel our arms and legs and from there begin to move, open up and stretch out, then the plastic film that our fears create will naturally fall away. And God helps us feel ourselves? Yes, because God sees us and knows our true nature and true potential much more than anyone else, much more than even ourselves will ever know. So when we open ourselves up to God and we do so in an emotional way, we not only can feel God’s overflowing love for us, we begin to feel more and more how God feels about us and because God’s feelings are based on knowing us fully, we very rapidly feel ourselves fully too and so we begin to know and see who we truly are. We also begin to see that we not only deserve love but we also deserve the highest form of love in existence – the love God has for us and eagerly awaits for us to feel. This entry was posted in Conversations and tagged Design, emotions, God, god doesn, intellectual tools, measuring device, religion, responsibility, Science on November 19, 2012 by David.